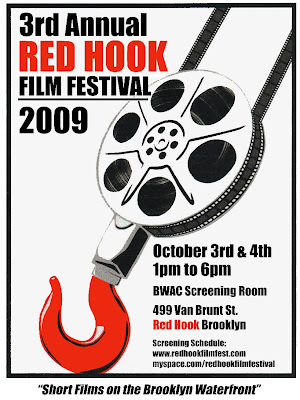 The 3rd annual Red Hook Film Festival took place in October 2009. The festival screened 5 blocks of short films in a Civil War era warehouse on the waterfront of Red Hook, Brooklyn. As an advisor and juror at this year's festival, I was happy to see that they included several films about industry and abandoned spaces, which are two defining aspects of the Red Hook landscape. On Saturday, the festival opened with "Lavendar Lake" - a portrait of Brooklyn's polluted, industrial Gowanus Canal. Following that was a screening block titled "Abandonment Issues" which includes films set inside abandoned power plants, insane asylums, sewers and factories. On Sunday, the festival presented an "Urban Industry" screening block, with films about rooftop farms, industrial Williamsburg, squatters in the Lower East Side, and a documentary about the Atlantic Yards development titled "Brooklyn Boondoggle." For more information, visit the festival's website and myspace. It is very interesting for me to read the blog. Thank author for it. I like such themes and anything that is connected to them. I would like to read more soon.